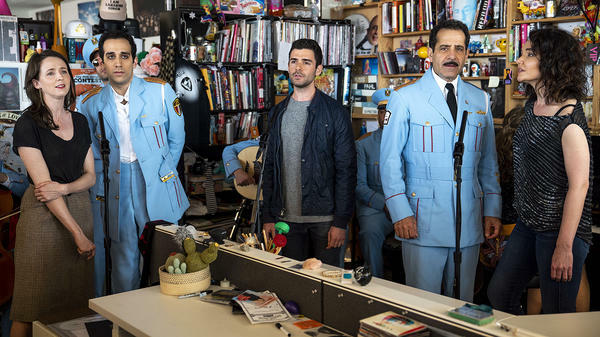 The Band's Visit perform a Tiny Desk on May 15, 2018 (Eslah Attar/ NPR). The story of The Band's Visit, composer David Yazbek told the Tiny Desk audience, "is about hope and faith and silence and music." It tells the tale of Egyptian musicians stranded in a small Israeli village. The townspeople have no choice but to take them in. Eventually, the love of music allows the characters to see past their differences and form an unlikely bond in a single night. The musical was adapted from the 2007 film and has been nominated for 11 Tony Awards. From the first note strummed on the oud, Yazbek's nominated score transports the Tiny Desk to the Middle East with traditional instrumentation and melodies, and weaves in beautiful theatrical ballads. Among the cast are Tony Shalhoub (known for his TV roles in Monk and The Marvelous Mrs. Maisel) and Broadway veteran Katrina Lenk (Spider-Man: Turn Off the Dark, Once and Indecent). They both have been nominated for their lead performances. Although it's a Broadway smash hit, it lacks the opulent, bring-down-the-house song and dance numbers. It's a more intimate show with some universal messages that fit the up, close and personal space of the Tiny Desk. The Band's Visit insists that it's OK, even essential, to get "stuck" with strangers who have different perspectives. It serves as a poignant reminder that our common connection to music can rise above the noise of intolerance. When you drink, drink deeply. you can never end the dark. in your mouth, the sweet shock of honey. Harvey Valdes (oud / guitar), Garo Yellin (cello), Sam Sadigursky (clarinets), Ossama Farouk (darbuka / frame drum), Alexandra Eckhardt (bass), Andrea Grody (piano), David Yazbek (composer / host), Katrina Lenk ("Dina" / vocals), Kristen Sieh ("Iris" / vocals), Adam Kantor ("Telephone Guy" / vocals), Tony Shalhoub ("Tewfiq" / vocals), George Abud ("Camal" / violin / vocals). Producers: Josh Rogosin, Morgan Noelle Smith, Tom Huizenga, Jeff Rogers; Creative Director: Bob Boilen; Audio Engineers: Josh Rogosin, James Willetts; Videographers: Morgan Noelle Smith, Niki Walker, Bronson Arcuri, Maia Stern; Production Assistant: Stefanie Fernández; Photo: Eslah Attar/NPR.